Over the past few seasons, the Cubs’ offensive trademark has been their ability to wear down starting pitchers by grinding out at-bats early in the game and forcing the opposing pitcher to throw a high number of pitches. Even in games in which they didn’t score early, the Cubs maintained a confidence that they would eventually break through against a starter. And in 2016 and 2017, this was generally the case. The Cubs were among the best in baseball at getting to a starter when seeing him for the third time in a game, ranking seventh in baseball 2016 and second in 2017 by sOPS+ (more details on this below). In 2018, however, the Cubs have fared quite poorly when facing a starting pitcher for a third time, falling all the way to 26th in baseball. The “times through the order” effect has been well documented in the sabermetric community. Generally speaking, research shows that the more times that a lineup faces a pitcher in the same game, the greater success the offense will have. 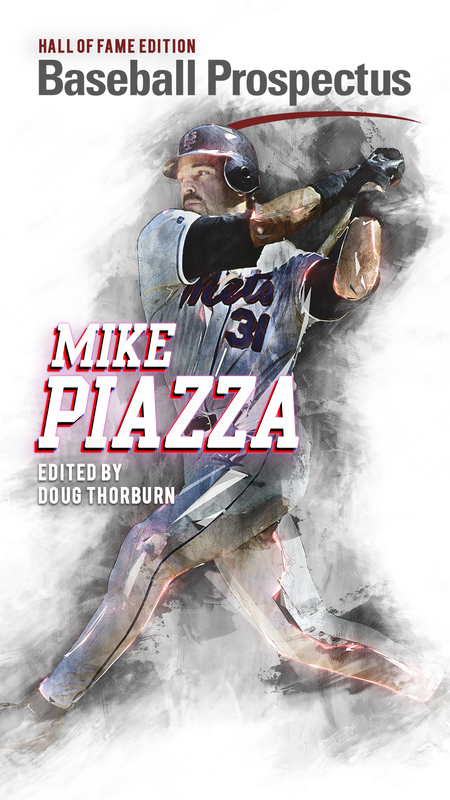 The basis of this effect is intuitive—as a starter begins to fatigue as he works deeper into the game, he is facing hitters who have seen him before. 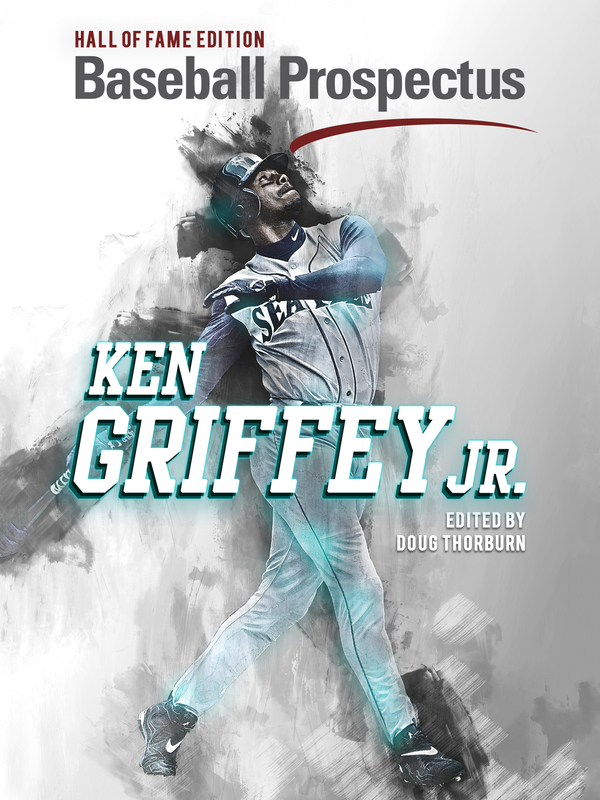 Not only is his effectiveness diminishing, but hitters are now familiar with how his pitches move, and what his game plan is to attack them. It stands to reason that the scales would start to tip in favor of the hitters the more times they face the same pitcher. Front offices and managers are aware of this effect, and it is the primary motivation behind the declining number of innings pitched by starters across the league, especially in the postseason, when stakes are highest and there are more built-in days off for relievers. To be sure, the Cubs offense in 2018 is among the best in baseball by almost every measure. They lead the NL in in runs per game, batting average, on-base percentage, slugging and TAv. Curiously, however, they have not been inflicting damage on starters the third time seeing them in a game. To help explain this, I would like to introduce two very handy stats from Baseball Reference—tOPS+ and sOPS+. tOPS+ is a measure of how well a player or team produces in a certain situation, relative to how well they produce across all situations. The number is scaled such that 100 means that they team or player produces exactly the same in a given situation as they do in general. Numbers greater than 100 mean better production, and numbers less than 100 mean worse. For example, if a team has a tOPS+ of 120 with runners in scoring position, that means they hit 20% better with runners in scoring position, relative to how they hit in all situations. Similarly, sOPS+ compares how a team or player does in a given situation to how the rest of the league does in that same situation. sOPS+ is on the same scale as tOPS+, such that a team with an sOPS+ of 100 in a given situation is exactly league average. It is important to note that tOPS+ compares the team or player only to itself, while sOPS+ compares the team to the rest of the league. For example, the Baltimore Orioles have a tOPS+ of 104 when facing a starting pitcher for a third time in 2018, which sounds good, but because their offense is so dreadful, their sOPS+ is just 72. The Orioles are slightly better than their typical selves when facing a pitcher for the third time in a game, but because their baseline is so low, their actual production is still bad compared to the rest of the league. 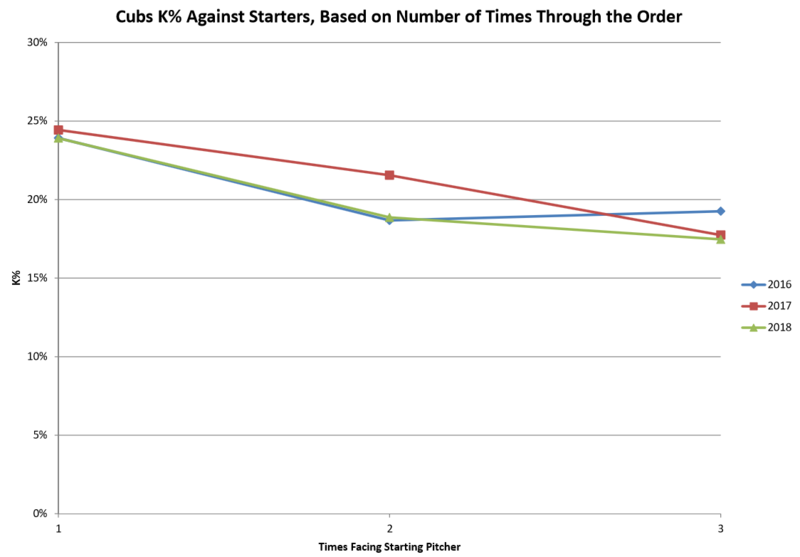 With that in mind, the tables below give a sense of how the Cubs have fared over the last few years against starting pitchers, grouped by number of times through the order. What could be behind this? My first instinct was to look at strikeout rate and walk rate to see if the Cubs were somehow showing a change in plate discipline. 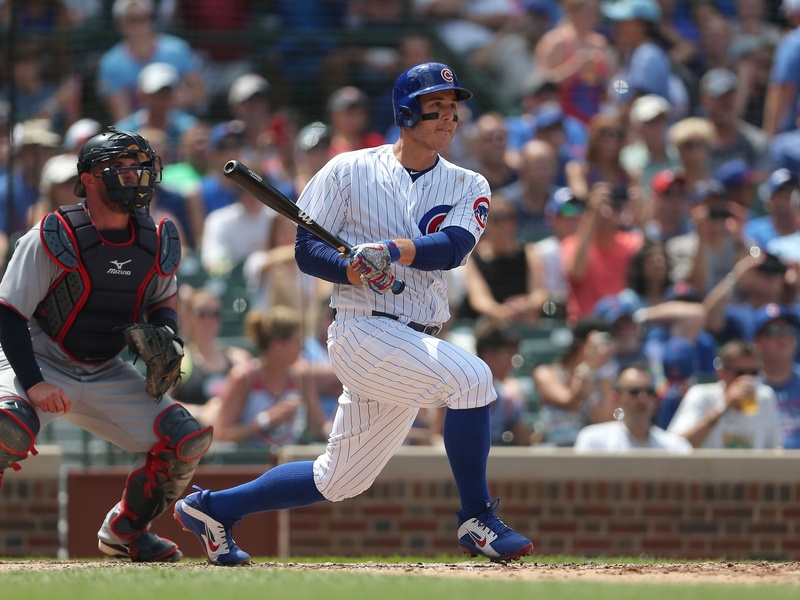 Albert Almora and Javier Báez have played much greater roles in the offense this season, and perhaps their free-swinging tendencies have had some impact. However, as shown in the graphs below, there is no discernible difference between this season and the two previous ones in terms of these stats. In each year, strikeout rate declines each time through the order, as one would expect, and the walk rate remains relatively constant. So plate discipline isn’t the issue. In 2016 and 2017, the Cubs got consistently better each time through the order, and they were above league average, no matter the situation. The 2017 team, in particular, really punished pitchers when facing them for a third time. The 2018 club, however, shows a perplexing reversal of this trend. This season, the Cubs are 15-20% better than the rest of the league the first two times through the order by sOPS+, but are somehow almost 20% worse than the rest of the league on the third time through. 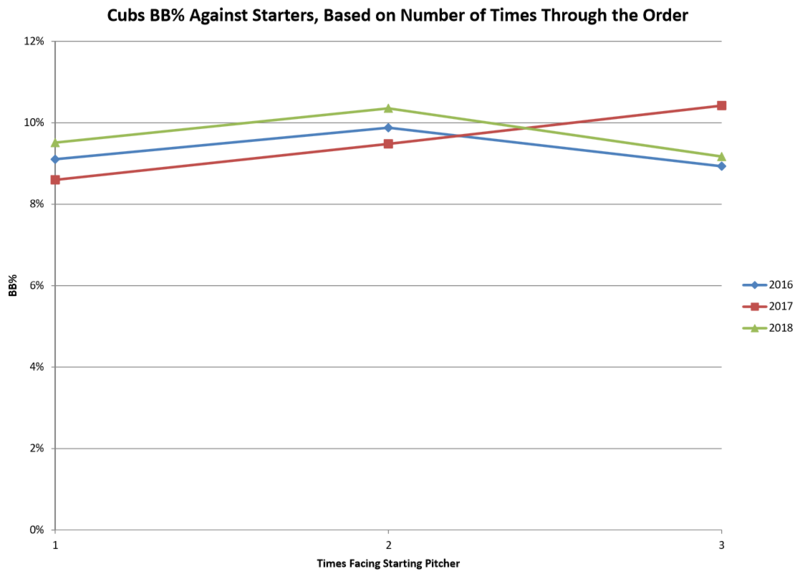 Relative to how they produce in all situations, the Cubs are 14% worse on their third turn through the order. The next logical place to look is batting average on balls in play—maybe the team just getting unlucky on batted balls, which is driving production down. Sure enough, the Cubs’ BABIP on their third time through the order is just .270, substantially lower than the .319 they put up in all situations (which is best in baseball). Notably, Anthony Rizzo’s BABIP is just .204 on the third time through the order, and Báez’s is .214, numbers that seem primed to bounce back. So that’s it, right? Just sit back and wait for some of those bloopers to fall in for hits? Maybe that’s part of the issue. However, the numbers suggest that that the quality of contact on the third time through the order hasn’t been very good, either, and perhaps the low BABIP is deserved. Without digging into the Statcast numbers, I wanted to get a sense of how much quality contact the Cubs are making the each time through the order. To do this, I used home runs per plate appearance (HR%) as a proxy for contact quality. It isn’t a perfect metric, but it should give us a general sense of how frequently the Cubs have been able to square balls up. 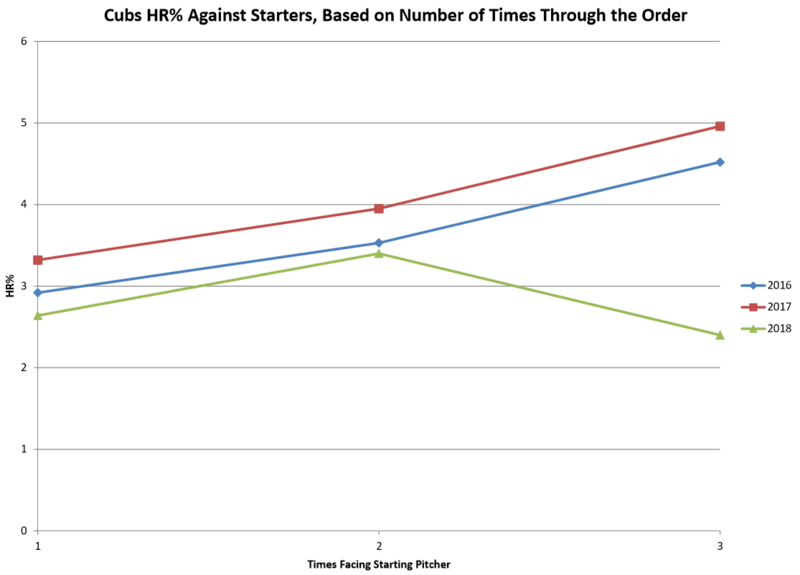 In 2016 and 2017, the Cubs HR% increased each time through the order, consistent with the “times through the order” effect. In 2018, we see the same trend between the first and second times through the order. However, on the third time through, HR% has dropped off dramatically. The HR% of 2.4% on the third time through this season is basically half of what it has been the past two years, and ranks 26th out of 30 teams this season. Based on that, it seems safe to say that the quality of contact is much worse than it has been in years past. The reason behind this is unclear. Is it an approach issue? Much has been made of new hitting coach Chili Davis’s philosophy, and some are concerned that the Cubs have traded too much power for contact this season. However, if that were the case, it would show up more than just on the third time through the order. Could it be a confidence issue? That seems unlikely, as this year’s team features essentially the same offensive contributors as 2017, and confidence has never been much of an issue with Maddon’s Cubs. More likely, this is just a strange blip. Even though the sample size is over 800 plate appearances, it only considers about 14% of the plate appearances taken by the Cubs this season. Also, this particular split relies heavily on the production of the hitters up at the top of the order, since they are the ones getting the most plate appearances against the starter for a third time. Kris Bryant, who throughout his career has been an even better version of himself when facing a pitcher for the third time (tOPS+ of 124 and 141 the last two seasons) has been going through a power drought stretching back into early May. Anthony Rizzo had a dreadful April and a pedestrian June, which may have dragged the team numbers down, as well. In summary, production is down the third time through the order this season for the Cubs, and a lack of solid contact appears to be the main culprit. This has manifested in the big drop in home runs, and it could also be a contributing factor to the low BABIP. Hopefully, this is just a small statistical blip, and over the next few months, a combination of more hard contact and better batted ball luck brings the Cubs back up to where they have been in recent years. Either way, it’s something that bears watching throughout the remainder of the season. Given that managers are more aware than ever of the 3rd-time-through effect, my first instinct would have been to check whether the 3rd-time-through opportunities have decreased dramatically, increasing the noise of the statistic.